STABUGOM® gummed tape offers an efficient and definitive closing solution for boxes, while the anti-slip coating on the outside of the product affords it anti-slip properties. Strongly recommended when your products are shipped in maritime containers. 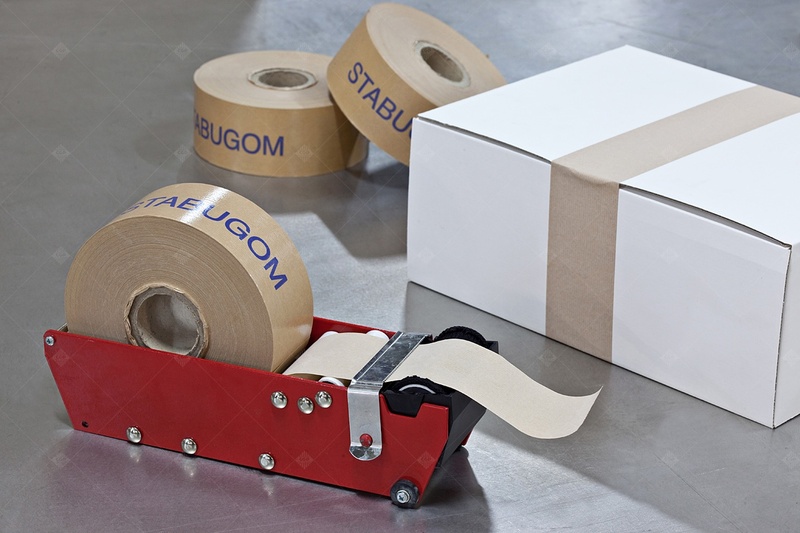 Specially adapted when reliable closure is desired under extreme heat and humidity conditions, STABUGOM® anti-slip gummed tape is designed to maintain boxes closed, including during long-distance shipments. The gummed tape cannot be removed without damaging the box's covering, thus proving a tamper-proof indicator for the secondary packaging. When the use of a slip sheet isn't possible, STABUGOM® gummed tape can be used to stabilize the pallet load owing to its external anti-slip surface. STABUGOM® offers a 2-in-1 box closing and pallet stabilization solution. For closing boxes, the adhesive on the gummed side must first be reactivated with water so it can be applied to the box. The adhesive, reactivated by water, penetrates into the box's cardboard fibers. Closure is rapid and permanent without applying pressure. The outside face of the tape is coated with an anti-slip solution for load stabilization. The coating increases the coefficient of friction providing palletized boxes greater stability and prevents slippage during product handling and transport operations. STABUGOM® is an eco-friendly product made from Kraft paper and vegetable adhesive, and thus 100% recyclable, 100% repulpable making it 100% ecological. The tape, with a gummed side and an anti-slip side (external face) comes in rolls of either standard or custom dimensions. The gummed Kraft rolls are used on mobile closing systems with a built-in wetting feature for manual closing or can be installed in fixed stations for semi-mechanized or auto-mechanized closing. 100% Ecological, STABUGOM® is a recyclable Kraft paper tape coated with a water-based adhesive that is reactivated by water. it is a paper mono-product, making sorting unnecessary. Everything can be disposed of directly in the paper bin. High resistant, tamperproof marking, the cardboard rips when the box is opened. The anti-slip coating provides boxes exceptional stability. STABUGOM® gummed and anti-slip tape is easy to use and can be loaded into the same dispensers used for conventional adhesive packaging tape. Our team of EXPERTs are at your disposal to assist you with our project.